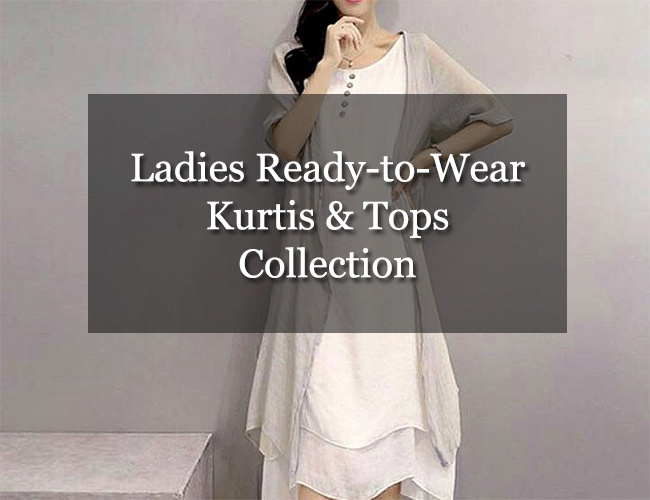 In summers, light weight yet stylish top or kurtis can be your best option which can be paired with tights, trousers or jeans according to event and your choice. 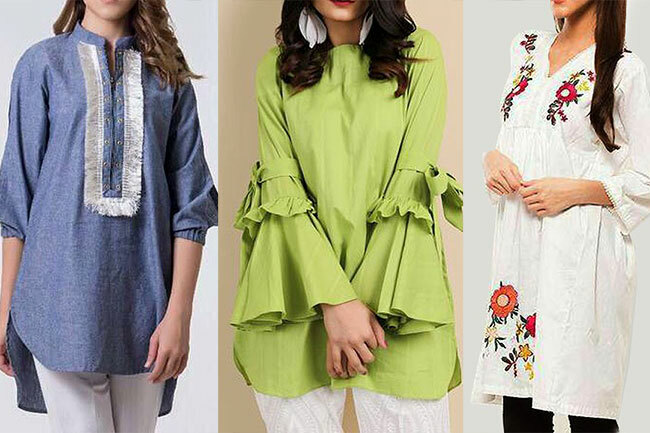 They are reasonably priced and are perfect to fill your closet along with heavy and costly lawn dresses which make you worry by the chance of being spoiled with daily wear and too much wash. On other hand, plain or printed ladies kurtis not only look stylish but give you ease of mind by being less pricey. There are many options you can choose for your self and today i am going to tell you about some trendy styles which are in fashion these days. If you are worried about what to wear daily while going to college, universities or for other academic routines, then choosing some trendy tops are great for you. Denim tops are quite in trend from last year and got popular with different cuts and designs. Pairing it with trousers or tights will not only make it comfortable to wear but gives you and edgy look. For more chick look you have got the options to add frills in your top. Beautifully cut frills with flared sleeves is something to look forward to. For more comfortable wear, you can opt for plain cotton tops with light thread embroidery for elegant touch. 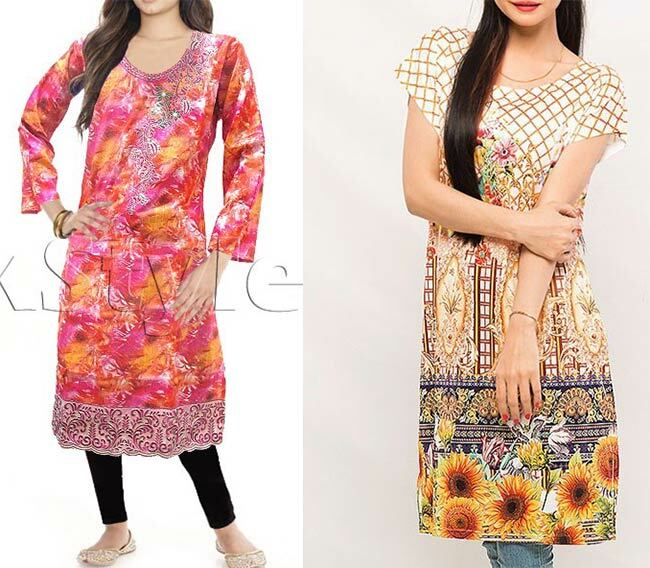 Printed lawn and cotton kurtis are also great option for every day being they are light weight and airy. In latest collection of lawn prints, you can find many beautiful ready to wear tops along with three piece lawn dresses. These single pieces are available with only prints or light embroidery. 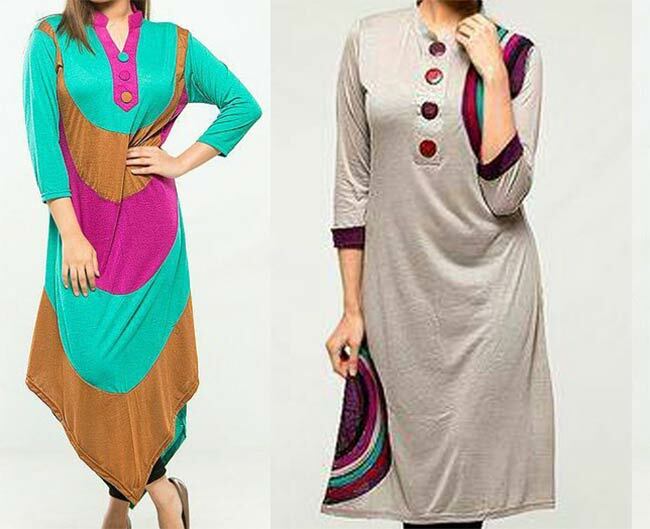 You can even wear these multi color embroidery kurtis on formal events or for office wear. You can also get those amazing digital print kurits which without embroidery look amazing. For more edgy and chic look, you can opt for viscose materiel which is very light weight, have amazing fall and looks great on every one. There are many styles available in this material. You can either go for light printed tops or can choose vibrant multi color top. The most amazing thing is that you can buy these womens clothes online easily.